A new photo series that has been getting a fair amount of press attention has got us excited. 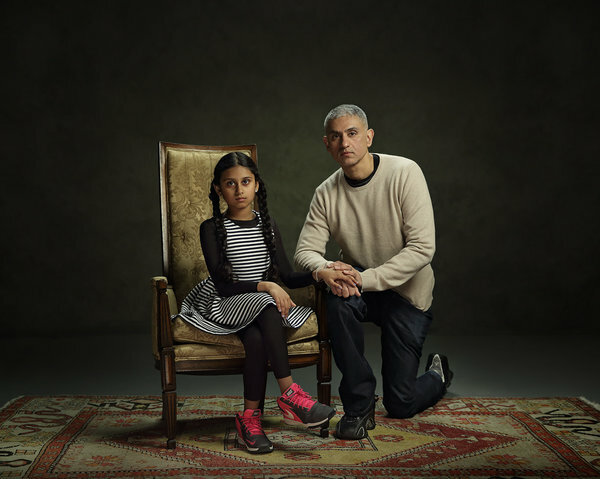 The ‘Dear Daughters’ project comes from photographers Marzia Messina and Sham Hinchey, and captures 22 men and their daughters, all between 8 -11 years old, talking about feminism. 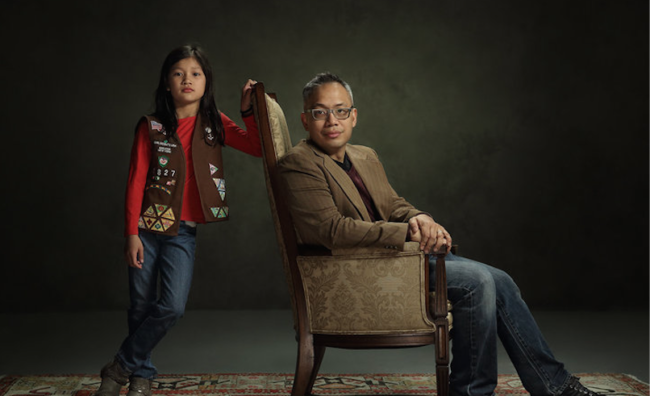 The series of images are accompanied by video and text, giving readers more insight into each of the conversations between the girls and their fathers. The images, which have been shared on their Facebook Page (as well as with The Huffington Post) were created to mimic the old-school family portrait style, but this time with the daughters positioned to show their confidence. 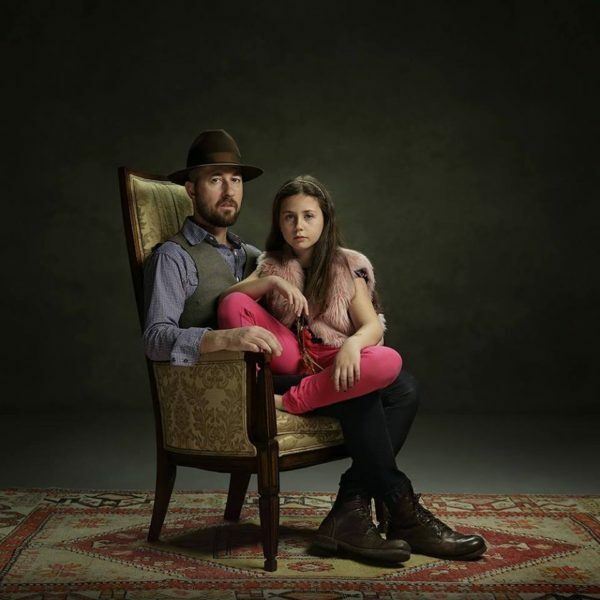 Marzia and Sham, who are more commonly known as Mars and Sham, not only create great photography together, they also have a 10 year old daughter together named Penelope, who was essentially the catalyst for this project. From the responses they were getting it was clear that some of the dads had never considered such ideas about equality, and it took participating in this project and having a daughter in the first place to really see first hand the type of world that exists for women today, even in the most advanced countries on earth. Mars and Sham say their own daughter has influenced them in this way and recognized the importance of having conversations about equality and gender from a young age. “Through her we have seen how children of this age start asking questions regarding social issues and it is interesting to watch them process news, trying to rationalize and decipher events which in their minds are absurd or unjust,” said mom Marzia to HuffPost. Through recent political and social news stories, there has been dialog about the need for men to recognize women as equals outside of mentioning their own wives, sisters, mothers, daughters etc. But as dad Sham explained to Glamour Mag’s Shay Maunz, they felt this was at least a good place to begin. “We really wanted to hear men talk on the question of feminism and women’s rights and the role of a woman in the society. We thought a good place to start was with fathers who have daughters, because it might be easier for them to empathize with their young daughter so they could kind of learn through them,” he said. Sham not only participated in the project with Penelope, he pointed out how it was important for the couple to portray dads talking with daughters about feminism because typically society expects this type of conversation to be carried out by mothers. “We always delegate those kinds of conversations to the mom. But if we do put ourselves in that place as dads, it can strengthen our relationship with our kids. And I think that putting men in women’s shoes for a while—that’s how we get them on board with the movement for equality,” he said. Some of the board game conversations can be read on the Dear Daughters Facebook Page, and were also shared in a feature on Life Framer. One of the fathers outlined his concerns for his daughter in the current political environment, when asked what worried him most about raising a girl in a chauvinist world. “I don’t want my daughter to lose her confidence, to lose hope and say this is what we have, this is the way the world is, there is no hope. With the recent political events it’s almost like we’re going back again. We’re here and all of a sudden women are being objectified again, they are losing all the ground that has been gained since the dark ages. I still want you to have confidence, we can still win this battle, we’re still in it,” said Chris, father of Christina. Sham and Penelope discussed a scenario where a woman and a man were applying for the same job but the man, who was less qualified ended up landing the gig. In their conversation, they touched on a topic that was the underlying thread throughout the 2016 presidential election – sexism – leading to the eventual result of Donald Trump, who is a known sexual predator, getting elected. “A lot of men don’t like taking orders from a woman. They’ll say “who are you? I’ve always had this privilege, I tell you what to do.” He’s always been used to giving the orders and all of a sudden one day a woman is making the decisions and maybe he is not comfortable with that or maybe even simpler than that a lot of men feel uncomfortable working around women,” said Sham. “I don’t think they like being under a woman’s control… Maybe they feel uncomfortable being under a woman’s power, having to be on a lower standard than the woman,” said Penelope.